Seven is considered a lucky number by many people. If your fantasy football team is currently 1-5, you might need a little luck for Week 7. I’m considered lucky because I got my full crew of hosts back for Prime Time Fantasy Football! 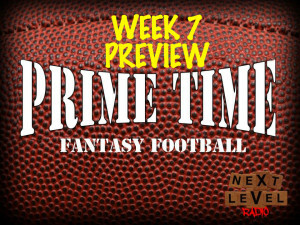 On the Week 7 preview show of Prime Time we’ve got you covered from multiple angles once again. Our listener questions will include our opinions on a late blooming wide receiver, an under-achieving wide receiver, and some possible trade options regarding an intriguing running back. Then, of course, we cover every game happening this week; which includes another Thursday night game and another London game. We also get into plenty of quarterback, wide receiver, and tight end options you should be using as bye week fill-ins (or not). Plus I’m the new leader in the clubhouse for Show Me The Money! So I have no problem telling you we close the show with more picks and our Facts of the Week.